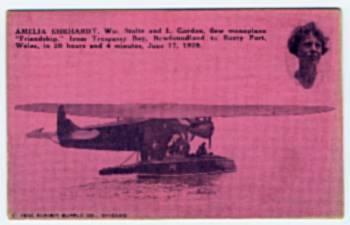 JACK734-Amelia Earhardt and L. Gordon fly monoplane from Trespassy Bay, Newfoundland to Burry Port, Wales, in 20 hours and 4 minutes, June 17, 1928. Original print free of scanning grid. 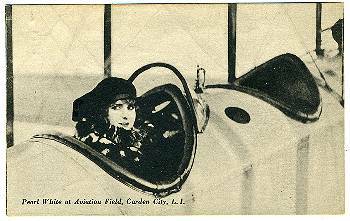 Printed 1930 Exhibit Supply Co.
JACK736-Mlle Helene Dutrieu in a Farman biplane. French issue, printed. 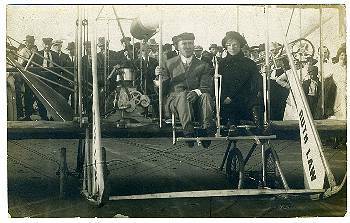 JACK737-A great photo which not only shows the aviatrix but also a passenger on far right who sent the photo! 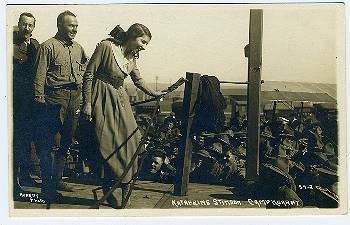 JACK738-Katherine Stinson at Camp Kearny. Beautiful photo, rare. Kearny Photo. Message on back is neatly x'd out. 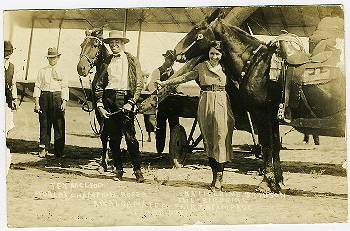 JACK739-Rare photo of Katherine Stinson and the world's champion roper, Tex McLeod, at a stampede. Message on back. 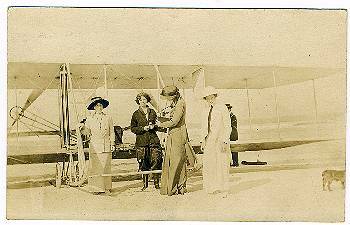 JACK740-Pearl White at Aviation Field, Garden City, L.I. Back has Excelsor trademark and type that states card was published Post Exchange Concentration Camp. One cent stamp box. JACK741-Mlle. 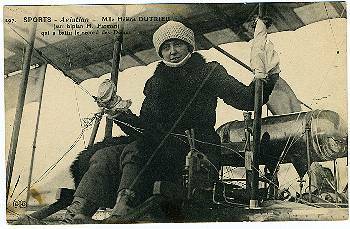 Dutrieu, "The Lady Flier." See above. British post card. JACK742-Baby Jumbo. The Daily Mirror. 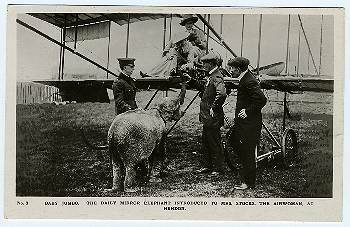 The elephant in the image introduced to Mrs. Stocks, the air woman at Hendon. 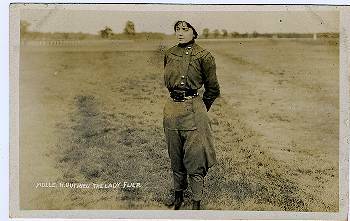 1912 handwritten on back. 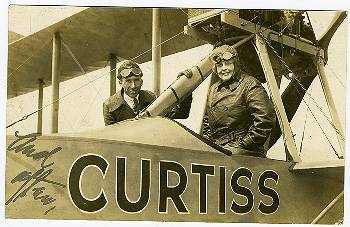 JACK743-wonderful photo of Ruth Law in a Curtiss plane. 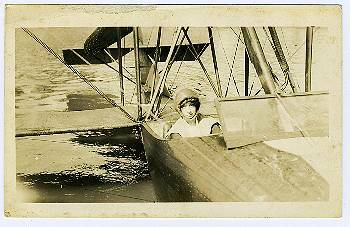 JACK744-Early woman aviator in a hydroplane. JACK745-A TUCKS photo of Amy Johnston. 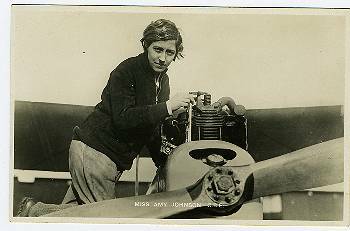 She flew from England to Australia in a second-hand "Moth" airplane in 28 days, 18 of which were in the air. 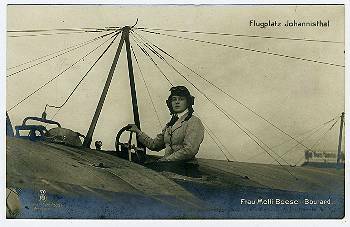 JACK746-A German photo, Frau Melli Beese-Boutard. 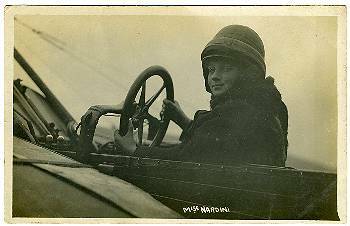 JACK747-Miss Nardini, British close-up by Topical Postcard Co., Winton, Bournemouth. 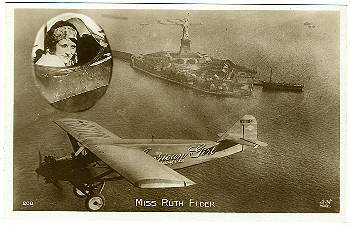 JACK748-Miss Ruth Elder flying over the Statue of Liberty. Postcard made in France!